Sometimes you have a day where you make exactly two pans of failed brownies. This happens. It’s a hazard of the trade. It’s my job to fail at these things so y’all don’t have to. I get it. It can just be kind of heart-breaking to pull a freshly baked batch of brownies out of the oven, cut yourself a slice, put the fork into your mouth and then… *gag*. Maybe squash was a bad choice. I admit it. Chocolate + Squash isn’t the brownie dream team. Lesson learned. After my squash-tastrophe, I really needed a recipe WIN! I set aside the remnants of Browniegate and started making some soup. Soup is comforting. Soup is kind. Soup will warm you up and hug you on the inside. I needed an inside hug. Sounds creepy, but I stand by my statement. 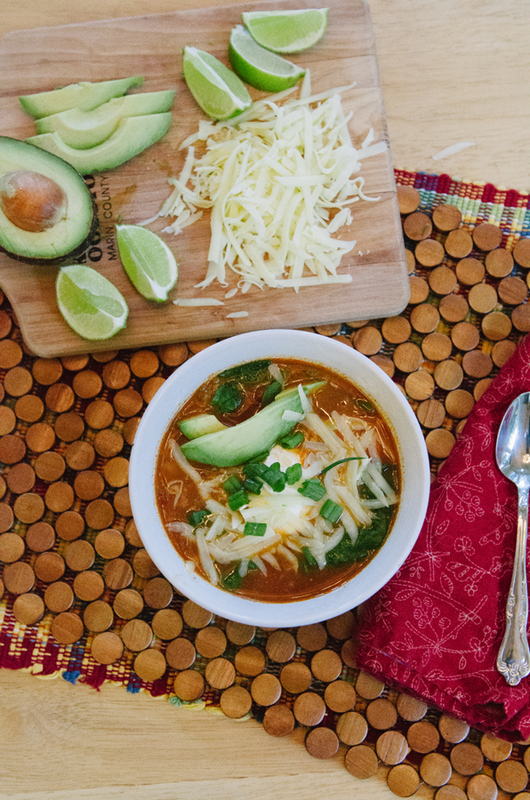 This Fiesta Soup is a total inside liquid tummy hug. The spices are warming, the chicken is tender. The soup gains a little thickness with the aid of some corn tortillas. If you are Paleo, feel free to leave them out. The flavor of the soup will still be just as good, you will just lose a little bit of the heft. Top it off with some avocado, sour cream, raw cheddar and scallions! Heck to the yes. Par-tay in a bowl!! So. Much. Better. Than. Squash. Brownies. Oh, guess what?! Did you know that yesterday was So…Let’s Hang Out’s first birthday? Yup. My baby is one. I’m planning on throwing us a birthday party all next week! There’s going to be cake. Maybe a lil’ giveaway. Definitely some dancing. You are all invited. I encourage you to sign up for the new So…Let’s Hang Out Newsletter. It goes out weekly and let’s you know what’s up. It will alert you of special giveaways and what not. You wouldn’t want to miss out on our birthday shenanigans, right? I’m probably going to get sappy on you, have a cocktail, and tell you all just how much I love you (because I DO–like, A LOT). Prepare yourselves. 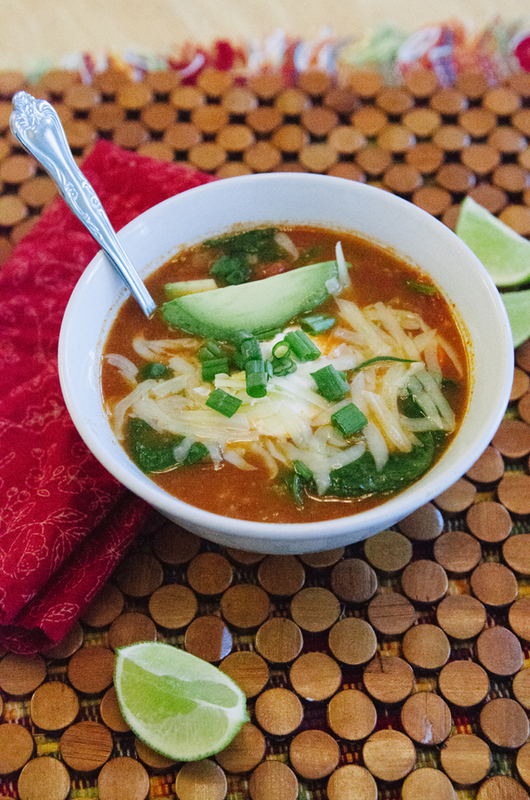 Until then, I’ve made you this FIESTA CHICKEN SOUP! No one said we couldn’t have a little Mexican celebration in the meantime, right? Let’s put on our sombreros and start a conga line. That’s the spirit. Really get those hips going. Perfect. In a large soup pot, heat up your coconut oil over medium heat until it melts and coats the bottom of the pot. Add in your chopped onion and your minced garlic. Allow the onions to sweat and brown with the garlic until both become fragrant and the onions are slightly translucent. Cut up your chicken thighs into bite sized pieces and add them to your pot to brown. Add in your chili powder, cumin, salt, pepper, and granulated garlic. Stir to coat the chicken. Once your chicken is browned, add in your celery and carrots. Stir together until the spices slightly color your entire mixture. Add in your fire roasted chiles and your can of tomatoes (including the juices!) Stir. Add in your chicken broth, stir together. Bring the pot to a boil and then turn it down and allow it to simmer for at least 30 minutes. Cut up your corn tortillas so that they are in small squares. It's super easy to do with a pizza cutter. Cut them into strips vertically, and then slice them into strips horizontally. It doesn't matter too much what they look like, as they are going to dissolve into our soup. Once your soup has been simmering for 30 minutes, add in your corn tortillas and allow your soup to simmer for at least an additional 15 minutes. The tortillas will dissolve into the soup and aid in making it a bit thicker. If you are Paleo, you can totally leave them out, your soup will just be a little thinner. Once your tortillas have cooked down into your soup, stir in your spinach. Your spinach will wilt as your stir it in. You're now ready to fiesta! Ladle out your bowl and top it with your desired toppings! Enjoy! I’ve been wanting to make a Mexican chicken soup ever since the restaurant I fell in love with it at, closed. This sounds yummy, but can you give me another (good) brand to sub for Trader Joe’s? I get really bummed out when I see delicious recipes that have their products in them (and the bloggers claim that their items REALLY make a difference) because #1: there isn’t a Trader Joes in my state and #2: I contacted them and they advised me they didn’t ship their products. What to do if you are a vegetarian I wonder, to get the same luscious tummy hug? I remember this soup fondly…. I’m making this for dinner tonight but with chicken breast and chiles in adobo sauce to kick up the spice 🙂 Thanks for the recipe!